Fill out our simple form and get quotes from local puppet show providers. Puppet Shows have been around since the ancient Greeks; it’s one of the oldest forms of storytelling we have! Nowadays they're a great option for a children’s party with a difference. 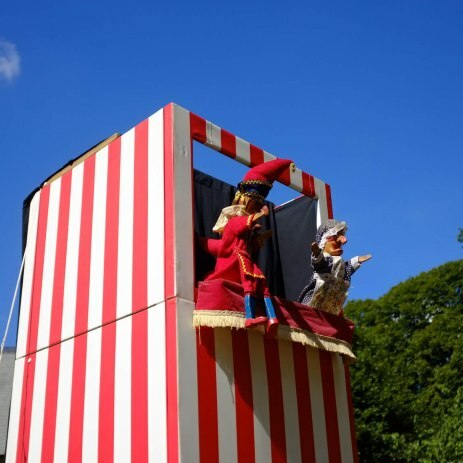 Puppet shows for kids are a fun way of entertaining your little guests but don’t worry if Punch and Judy isn’t your thing, most suppliers will be able to offer a variety of characters and themes to suit the occasion. To find out more and hear from Puppet Show performers in your area, complete a simple request form now. We are professional puppeteers and our shows delight children and adults across the UK. Our shows are full of adventure and fun and come complete with staging and scenery. Puppet Mania is a fantastic family show that includes live vocals, comedy and plenty of audience participation. You can also enjoy our String Puppet Theatre and our tiny tots Teddy Bears Picnic Show. Mr Bungle's Punch & Judy Puppet Shows, a traditional favourite, shows for all ages and events. Monkey BeanZ is always there to help the children warm up. We also offer exclusive puppet shows, which can be included into the mix. Children just love puppets so they are part of the Smartie Artie program. Some even talk...with a bit of ventriloquism of course. There are cuddly puppets and some that are so funny! There are many different types of puppet shows to choose from, ranging from simple finger puppets to string controlled marionettes which are held from above by the puppeteer. One thing all puppet shows have in common though is that kids love them! Children’s puppet shows are a sure fire way of keeping the kids engaged and laughing; puppet show performers are experts at making sure the whole party are having fun. Be sure to discuss with your supplier in advance what sort of characters you’d like to have in the performance; superhero’s, animals and famous faces are all options. To hear from puppet show performers in your area, just submit a request form.